Reduce the generation of static charges when worn by a production operator in a properly grounded ESD worker at a properly grounded ESD workstation. Drain away static charges when placed in contact with any charged dissipative or conductive object. 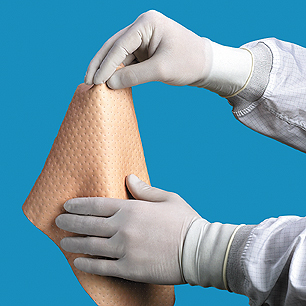 Cleanroom vinyl gloves are ideal for use in microelectronics, medical component manufacturing, and other cleanroom environments where a low particulate glove is needed. Vinyl carries an extremely low static charge providing excellent product protection for static-sensitive components. Specialty clean room gloves for chemical and high temperature are available specifically for clean rooms as well as a wide selection of nylon inspection clean room gloves and cotton clean room glove liners are in-stock. Contact Us on how to achieve compliance of USP 797.